The Nakamichi brand was by many considered to be the leading company for cassette decks. 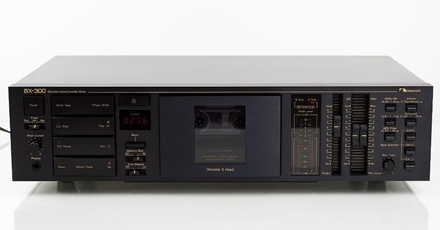 The BX-series was introduced in 1984 and the top of the line model in that series was the BX-300E (1984 – 1987). This is a tripple head machine which means that the play, record and erase heads are separate units. It enables playback during the recording. Also, it allows different record and playback head gaps to be used, which is important for the highest fidelity. A 2-head machine will use the same head for play and record. Another quality feature is the direct drive system which will reduce the risk for the machine to “eat tapes”.